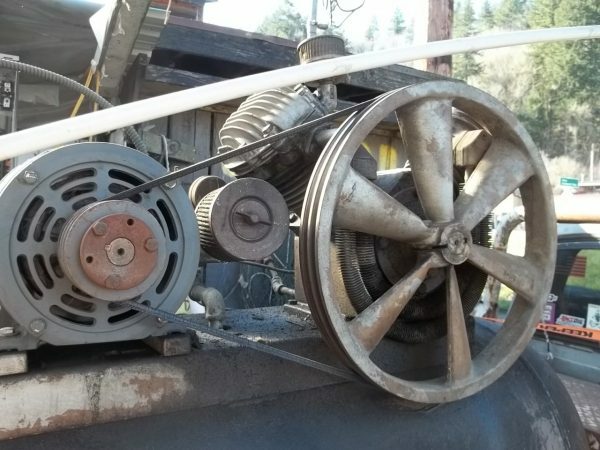 What motor HP for this old Hayward-Hallett air compressor? 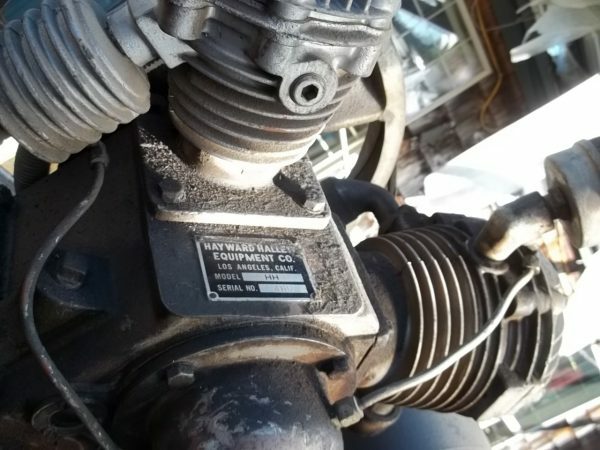 You are here: Home / What motor HP for this old Hayward-Hallett air compressor? Hi! 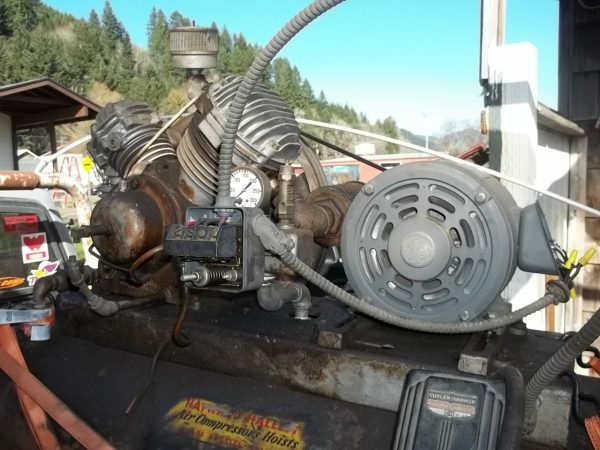 I just bought this old Hayward-Hallett air compressor. The pump says its a Model HH. 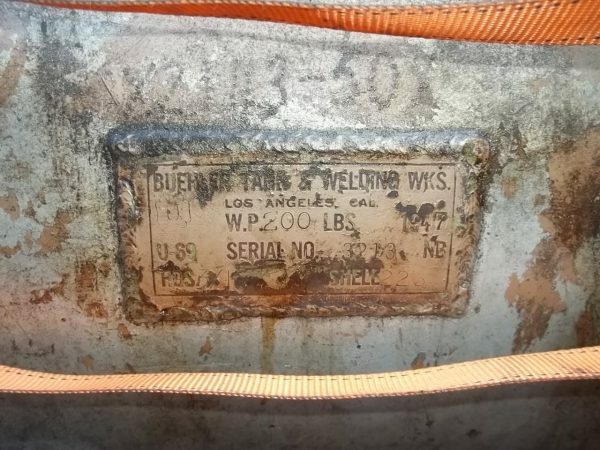 The tank is a Beuhler, says its rated to “WP 200”. Great big thing. Trick is, the motor has been replaced with a 3hp 3-phase GE unit. I don’t have 3 phase power available, so if 3hp will run the thing the cheapest way to do it is an invertor. But there’s no sense in making the 3hp motor run if it isn’t strong enough. So maybe put a 1 phase (5hp?) motor on it. Does anyone know what HP motor the things came with? Or other info- looks like a 2 stage to me, and spins by hand very well, apparently working. Thanks in advance! As you probably guessed, it’s a model HH as in Hayward-Hallett. And came with an air-hydraulic hoist (vehicle lift, probably). It’s two stage, so probably good for 175 psi or so. It may well have had a 5hp motor, or more, so if the price diff is OK by you, you probably should get the 5hp motor. Since lifts don’t get used that much, it’s possible it was up to that with 3hp. Parts may be a problem, but maybe not too bad, as it’s likely got things like automotive rings on it. I don’t suppose you got to see it run, did you? BUT the thing has very low gearing, and I don’t have much extreme air requirements. Just a one man shop. BUT I’ve been trying to run a harbor freight sandblaster, that runs my 3hp Sanborn out of air pretty fast. The books say that if you double the pressure on those, they work about 4x as well. 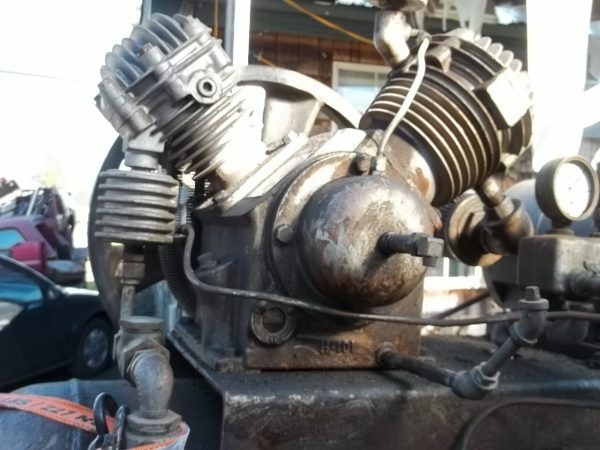 I just ordered a new 160 psi pump for the Sanborn (seized once, sanded the bearings, and has an increasing rod knock.). 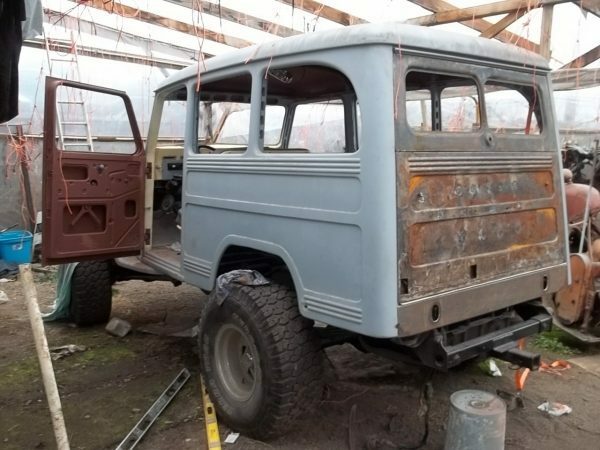 Not to mention that the motor that’s on there looks pretty husky for a 3hp, and once it gets good and dirty- or painted- it will look like a stocker almost, or a vintage replacement. So far the plan is to use both compressors together for the sandblaster, and just use one compressor most of the time. New motor = $200, invertor = $80. But a new motor is obviously new. Ha I still can’t decide- I think I want the vintage look especially if its cheaper. Would go well with my vintage shop- someday. But thanks so much for your input- the plan is coming together I think haha. Forgot to mention, thanks for the very nice informative pix! The very least I could do! Thank YOU for your input.